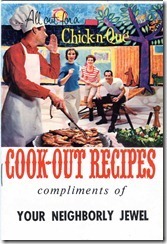 All Out For A Chick-n-Que is now scanned and available in our Digital Library of vintage cookbooks. This book is another from my grandmother’s stash of clipped recipes and grocery store handouts. This one comes from Jewel, the grocery store in Chicago during her lifetime. Whenever we would visit her in her brick home on Linder Ave., she would have rolls, deli chicken breast and sliced American cheese from The Jewel. 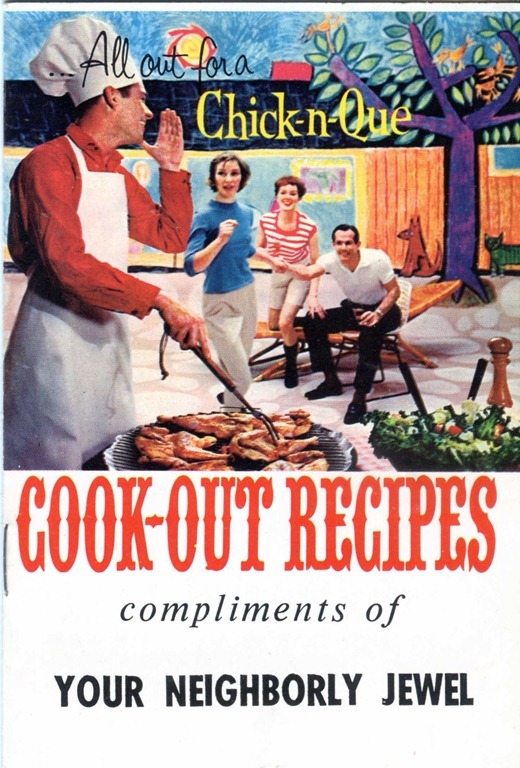 So get all of your friends together, break out your man-apron, your nifty hat, your cardboard dog and your MSG, because this is going to teach you how to host one rockin’ Chick-n-Que. Sweet Ruth! These Flipping Books are SO cool! Thanks, Sara!!! I happen to think they are pretty awesome myself!